CENTRAL PA RACING SCENE: SELINSGROVE SPEEDWAY BEATS THE RAIN SATURDAY: KELLER, FRYE, HULSON & LAWTON SCORE THRILLING VICTORIES! SELINSGROVE SPEEDWAY BEATS THE RAIN SATURDAY: KELLER, FRYE, HULSON & LAWTON SCORE THRILLING VICTORIES! SELINSGROVE, Pa. – When the skies cleared of rain and race cars hit the track Saturday at Selinsgrove Speedway, fans were on the edge of their seats from flag to flag in what was another exciting night of dirt track racing on the half-mile oval. Cody Keller of Selinsgrove drove to his first win in two years in the 25-lap 360 sprint car feature. Keller earned $2,000 in a borrowed Mach 1 Chassis house car for his sixth career win in 358-360 sprint car competition at Selinsgrove. Coleby Frye of Dover scored the win in the 25-lap Moon Shine Camo Route 35 Challenge Series for super late models after an intense wheel to wheel duel at the front the pack. The $2,200 victory was Frye’s second of the season and 19th career at Selinsgrove. When the leaders tangled in the 15-lap pro stock feature, Shaun Lawton of Bloomsburg inherited the lead and went to win his fifth race of the year, while Rick Hulson of Millersville, Md., held off late-race challenges for the 20-lap Mid-Atlantic modified checkers. 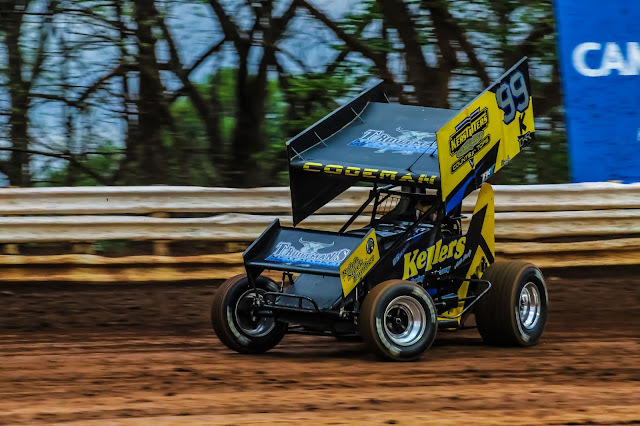 Selinsgrove Speedway is back with another action-packed racing program at 7:30 p.m. Saturday, Aug. 18, featuring the 360 sprint cars, limited late models, pro stocks, and roadrunners sponsored by Heller’s Gas. Track gates will open at 5 p.m.
Second-place starter Michael Walter drove around polesitter Ryan Higgins for the early lead in the sprint car feature. On the second circuit fourth-place starter Cody Keller pressured Higgins for the runner up position and took over the spot on lap four. An intense battle for the third position unfolded between eighth-place starter Davie Franek and sixth-place starter Chad Layton. Steve Buckwalter, who started 11th, also joined the race for third. The caution flag unfurled on lap 14 when Brandon McGough tagged the outside wall in turn four. When the race resumed, a war on wheels for the lead took place between Walter and Keller. The two young guns see-sawed for the lead until Keller secured the front spot on lap 15 with an inside pass in turns three and four. With Keller leading and Walter holding down second, another torrid race for third between Franek, Layton and seventh-place Jason Shultz stole the show. At the finish, Keller was victorious over Walter, Layton, Franek, and Shultz. In the super late model feature, polesitter Andy Haus pulled into the lead over front row starter Jerry Bard. Third-place starter Bryan Bernheisel made an inside pass in turn one by Bard to take over second. The event’s first caution flag waved on lap two when Tim Wilson’s car came to a stop in turn two. On the lap three restart, Haus held the lead with Bernheisel, Bard, fourth-place starter Hayes Mattern and eighth-place starter Coleby Frye in pursuit. At the halfway point, Dan Green spun in turn four and collected Jeff Rine, who was able to rejoin the race at the back of the pack. On the restart, Frye raced under Bernheisel for second in turn two when Bernheisel lost the handle and spun. On the ensuing restart, Haus led Frye with fifth-place starter Dylan Yoder showing some speed in the third position. On lap 19, the caution flag waved again when last week’s winner Rance Garlock stopped on the backstretch. On the lap 20 restart, Frye dived to the inside of Haus in turn one and drifted high only to have the leaders make contact. Haus’ car then rolled to a stop entering turn three ending his chances of a victory. Despite some damage to the back of Frye’s car, he held onto the lead and fended off Yoder in the final laps of the race for the win by the slimmest of margins. Ninth-place starter Shaun Jones, Bard, and Rine completed the top five. In the modified main event, polesitter Ray Kable grabbed the early lead and was challenged by fourth-place starter Rick Hulson. On the third circuit, Hulson took command of the field with an outside pass in turns three and four and opened up a comfortable lead. On lap four, second-place starter Brad Kling raced in the runner up spot and attempted to reel in the leader. A lap later, third-place starter Mike Altobelli Jr drove by Kable for the third position. With Hulson holding a good lead, a battle for the top five spots took place behind him also involving fifth-place starter Jim Bernheisel. Late-race cautions regrouped the field and set up a chase to the checkered between Hulson and Altobelli. In the final laps, Hulson and Altobelli raced wheel to wheel for the lead and win. At the checkered flag, Hulson narrowly scored the win over Altobelli, Kling, eighth-place starter Mike Corbin, and 10th-place starter Alyssa Rove. Polesitter Cory long led at the onset of the pro stock feature. The race was slowed on the first lap when Jake Buck and points leader Kyle Bachman collided in turn four with Bachman able to rejoin the race. On the restart, fifth-place starter AJ Hoffman and fourth-place starter Brandon Moser dueled for the lead. Hoffman and Moser swapped the lead several times while third-place starter Shaun Lawton raced in their shadows in third. Entering turn three on the 12th lap, Moser and Hoffman made contact and slid to a stop against the outside guardrail. Lawton inherited the lead and held off fifth-place starter AJ Stroup and Bachman for the win. Long and Brad Myers completed the top five. Heat Winners: Rick Hulson, Mike Altobelli Jr.